The Nchanga-Chingola copper-cobalt deposits are located on the northwestern extremity of the Kafue Anticline, immediately to the north of the town of Chingola (#Location: 12° 30' 6"S, 27° 51' 27"E). The initial discovery of copper at Nchanga was in 1923, when two prospectors employed by Rhodesia Congo Border Concessions Limited, were shown an outcrop of malachite bearing shale in the Nchanga Stream by the local Headman. Subsequent drilling and underground development revealed the River Lode orebody, on the vertically dipping northern limb of the Nchanga Syncline. In the following year W C Collier discovered the main Nchanga Open Pit (or Upper) orebody by trenching in a clearing ~1.5 km to the south. In 1926, Nchanga Copper Mines Ltd was formed and by 1927 diamond drilling had also disclosed the nearby Chingola and Mimbula deposits. In 1928 J A Bancroft of Anglo American Corporation instigated an intensive diamond drilling program which by 1931 had outlined the Nchanga West (or Lower) orebody with reserves totalling 143 Mt @ 4% Cu. Underground development was halted in 1931 due to flooding. However in 1937 Nchanga Consolidated Copper Mines was founded, the mine dewatered and operations have continued until the present. Early attempts to mine the Upper Orebody underground failed due to the weak and wet nature of the country rock. However in 1955 the Nchanga Open Pit was commenced, and smaller scale down dip underground mining was successfully started. Further open pits were commenced at Chingola ('A' and 'C' orebodies) in 1958, and Mimbula I and Fitula in 1967. Mining at the River Lode closed in 1972 and Chingola E in 1977. For details of the regional setting of Nchanga, the Central African/Zambian Copper Belt and the Lufilian Arc, see the separate Zambian Copperbelt record. The ores at Nchanga-Chingola are hosted by arenites and argillites of the Lower Roan Subgroup, which is composed of a thick (but variably developed) Footwall Formation that belongs to the Mindola Clastics Formation, and the overlying "Ore Formation" that equates to the regional Kitwe Formation. The ore at many of the other major deposits of the Zambian Copperbelt is largely concentrated in the Copperbelt Orebody Member argillites at the base of the Kitwe Formation. However, at Nchanga, ore is hosted by sandstones within the Mindola Clastics Formation, and both in the basal argillites, and by sandstones and argillites up to >100 m above the base of the Kitwe Formation that are elsewhere regarded as the hanging wall. These mineralised units are overlain by up to 300 m of barren dolomitic schist, dolostones, shales and grits representing the upper Kitwe Formation, and then by the dolostones of the Upper Roan Subgroup. One of the peculiarities of the Nchanga area is the Nchanga Red Granite, an unfoliated, coarse-grained peraluminous biotitic alkali granite with A-type geochemical characteristics, dated at 877±11 Ma (U-Pb SHRIMP zircon; Rainaud et al., 2000). This 15 x 10 km granite intrusion forms the main basement at Nchanga and may have influenced the pattern of basement subsidence and subsequent deformation, as it cuts across the grain of the country. It is a distinctive, coarse grained, pink, potassic variety occurring as a large ovoid dome, elongated NW-SE that forms the hub of the structures at Nchanga. Aplites are present in well defined veins and irregular shaped bodies. It has also apparently been rejuvenated during the Pan African event, with dates of 570 Ma being obtained in places. The other main basement lithologies belong to the ~2.05 to 1.85 Ga Lufubu Complex gneisses and schists, which includes the oldest dark, biotite-rich granite, with large crystals of microcline albite and quartz set in a matrix of quartz and feldspar, and the grey granite, characterised by coarse microcline in a groundmass of quartz and sericite after plagioclase. All three granites intrude sedimentary schists of the Lufubu Complex, derived from sedimentary protoliths. Basal Boulder Conglomerate, 0 to 1200 m thick - sheared and poorly sorted accumulation of rounded boulders, exfoliated slabs, cobbles and pebbles of granite, quartz-sericite schist and quartzite in a coarse unsorted arkosic matrix. These were deposited on the irregular surface of the basement, with the thickest developments being to the south of Mimbula, and on the northern limb of the Nchanga Syncline. Better developments of boulder conglomerate are found on the margins of steep basement ridges composed of gneisses and schist, while thinner basal conglomerate is preserved in gentle depressions over the Nchanga Red Granite (McKinnon and Smit, 1961; Fleischer et al., 1976). Arkose, 0 to 150 m thick - medium to coarse grained lithic greywackes composed of roughly equal amounts of well rounded pink non-perthitic microcline and opalescent quartz as coarse grains and pebbles in a quartz, feldspar, sericite and biotite matrix. The rock is more quartzose than the underlying granite. It is well bedded with silty layers and is commonly cross bedded. Where Lufubu Group basement gneisses and schists have contributed it is more micaceous and often difficult to distinguish from some of the basement lithologies. The bedding onlaps the basement hills and ridges, and by the top these positive basement features are mostly covered or had been eroded. Another conglomerate occurs near the top of the formation on the north limb of the Nchanga Syncline. The uppermost 27 m of the unit, which is generally adjacent to red granite hills where the Arkose is of minimal thickness, is the host to the 'Arkose Ore' of the Lower Orebody at Nchanga West, and at the Chingola B, C, D and E orebodies. At Chingola F the mineralisation lies 15 to 40 m below the Lower Banded Shale. Still further SW, at Mimbula this formation is represented by porous argillaceous feldspathic arenites, which are host to four ore lenses over a stratigraphic thickness of 75 m, the lowest 30 m below the Lower Banded Shale. Transition Sandstone (or Arkose), 0 to 6 m thick - weathered sandstone of subrounded grains of quartz and sericite flakes in a kaolin rich clay matrix, commonly iron stained and mineralised with Cu oxides and carbonates in the orebodies. Where exposed in the open pit it consists of a strongly kaolinised, sandy sedimentary breccia with clasts of calcareous siltstone and cherty beds and lenses. It has been suggested that this is an evaporite dissolution collapse breccia. Transition Quartzite, 0 to 6 m thick - also known as the Transitional Lower Banded Shale, comprises a finely laminated, bleached and silicified, banded dolomite, siltstone and shale, and is an alteration product of the Lower Banded Shale unit. Lower Banded Shale, 12 to 27 m thick - this unit corresponds to the the Copperbelt Orebody Member elsewhere on the Zambian Copperbelt. It comprises a grey to more commonly black, carbonaceous/graphitic laminated dolomitic shale, composed of quartz, dolomite, sericite, carbon, feldspar and accessory zircon and tourmaline, ubiquitously peppered with pyrite away from the orebodies. It may also appear as a grey silty argillite to a yellowish, finely laminated quartzite. Within the orebodies, the pyrite is replaced by chalcocite, bornite and chalcopyrite, as disseminations along laminations, and coarse aggregates in bedding veinlets. The upper sections of the unit above the orebodies are pyritic, with a horizon of quartz-pyrite geodes also near the top. This unit is the host to the Lower Orebody. Locally the shale is absent, possibly due to erosion immediately post deposition, or more likely due to displacement along a décollement. Brown Chert Marker, 0 to 6 m thick - fine porous micro-crystalline silica with muscovite and sericite flakes and hydrous Fe oxides. The chert is interpreted as a completely leached quartzose dolomite. Lower Banded Sandstone, 12 to 30 m thick - thinly bedded feldspathic sandstones and siltstones with a few somewhat better developed feldspathic quartzites. The principal components of the rock are quartz, feldspar and sericite, with abundant phlogpite and dolomite in some parts. In the oxidised zone it is a weathered clayey rock with sericite, brown mica and detrital quartz, commonly mineralised with cupriferous vermiculite, some malachite and cuprite in the vicinity of the orebodies. In general the Banded Sandstones, which are highly disrupted and deformed, are 'dirty arenites' which have been metamorphosed to alternating sandstone and schist. 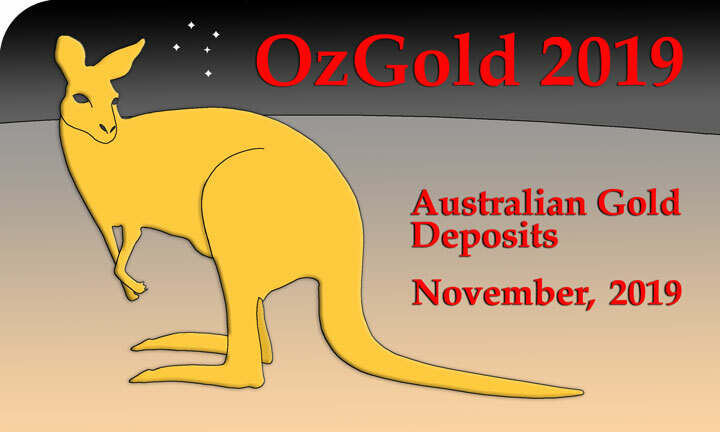 Dissolution of the dolomite-anhydrite content to a depth of more than 600m has reduced the Banded Sandstone to a soft incoherent rock mass causing considerable problems in both open pit and underground mining. Shale Marker, 0.5 to 2 m thick - a persistent laminated shaly sandstone to a compact fine grained micaceous quartzite with alternating light and dark bands of a reddish colour. It may be mineralised when the overlying Pink Quartzite is ore. Pink Quartzite, 4.5 to 6 m thick - a well sorted feldspathic quartzite with abundant microcline and quartz in a sericitic matrix. Ore lenses are hosted by this unit. Upper Banded Sandstone, 15 to 30 m thick - similar to the Lower Banded Sandstone, but contains more cupriferous vermiculite, mainly near orebodies. It has been deformed to a strongly schistose dolomite rich rock, locally with scapolite. The Black Marker, 0 to 4.5 m thick - only locally present in the Nchanga Syncline as a hard, massive, dark grey, silty, dolomitic, Fe-rich quartzite, commonly with ripple marked bedding planes. It is generally associated with areas of more intense folding. The Feldspathic Quartzite Transition, 4 to 8 m thick - a buff to pale grey feldspathic quartzite with argillite bands and lenticular interbeds of Banded Sandstone like micaceous material. This zone is interpreted to represent a sheared contact between the Banded Sandstones and The Feldspathic Quartzite, and not a lithological transition (McGowan et al., 2006). The Feldspathic Quartzite, 8 to 25 m thick - a buff-greyish-white, thick, competent, tabular cross bedded, well sorted, medium to coarse grained arkose to glassy quartzite. It is mainly composed of quartz (50 to 60%) and microcline (20 to 30%) in a matrix of the same minerals, with sericite, phlogopite and dolomite. Locally it contains carbonaceous material. This unit is the main host of the Upper Orebody. The contact with the overlying shales is transitional. Where sighted in the Nchanga Open Pit this unit was medium grained, well bedded and siliceous with white feldspars. Upper Banded Shale, 15 to 37 m thick - grey to dark grey laminated to finely bedded rock composed of alternating quartz-microcline and micaceous (vermiculite) laminae ranging from a shale to a phyllite, with sporadic carbonaceous material and in places a dolomitic cement. It becomes interbedded with dolomitic schists and dolomite of the Upper Roan Subgroup upwards. The basal 3 m contains Cu sulphides or oxides where the TFQ is mineralised. The upper part and the more dolomitic schist contain fairly extensive cupriferous vermiculite. Dolomitic Schist, 10 to 160 m thick, which has been included in the Upper Roan Subgroup by earlier authors (e.g., Mendelsohn, 1961), although the Lower to Upper Roan Subgroup boundary has been shifted to the base of the Upper Roan Dolomite unit (e.g., Binda and Mulgrew, 1974). The Dolomitic Schist comprises an alternating sequence of 0.2 to 2 m thick competent dolomite beds and 0.1 to 1 m thick deformed dolomite-phlogopite schists (Roberts et al., 2009). Chingola Dolomite, 12 to 47 m thick, the uppermost of the alternating dolomitic beds that caps the Dolomitic Schist. It is described as a light coloured quartzose and talcose dolomite (Diederix, 1977). The carbonate units of the dolomitic schist and Chingola Dolostone are usually totally leached to depths of ~300 m, with interbedded shales and schists weathered to red clay. Shale with Grit, ~120 m thick, mixed argillites and fine to medium-grained feldspathic sandstones. Upper Roan Subgroup - the Kitwe formation is overain by the dolostones, with minor argillite interbeds of the Upper Roan Subgroup, which at Nchanga is >135 m thick and commonly contain anhydrite (Roberts et al., 2009). The Lower Roan Subgroup have been subjected to lower greenschist facies metamorphosism, represented by variable proportions of phlogopite, sericite and the extensive recrystallisation of quartz. The host sequence was deposited, lapping onto a flat horst block of Nchanga Granite, formed by D1 extension, and was subsequently deformed by post-Katangan D2 compression during the Lufilian Orogeny. The latter compression inverted D1 extensional structures, particularly those bounding the granite block. The structure of the Katangan rocks is strongly influenced by the basement structure and geology. The core of the basement in the area is the rigid and resistant, crystalline, Nchanga Red Granite, which acted as a stable buttress, surrounded by the more ductile Lufubu Complex granitic gneisses and schists. Plastic deformation is more readily accommodated within the Lufubu complex and is particularly focussed at its contacts with the Nchanga Granite, in contrast to the sequence overlying the latter. D2 compression is represented by internal basement thrust propogation folds and layer parallel structural detachments. The basement thrusts locally persist into the Lower Roan clastic rocks, which are also subjected to displacement by detachments, controlled by the differential rheological properties of the host succession facies. Vergence on these structures is dominantly to the NE, although locally to the SW under the influence of the southward verging Nchanga Syncline. 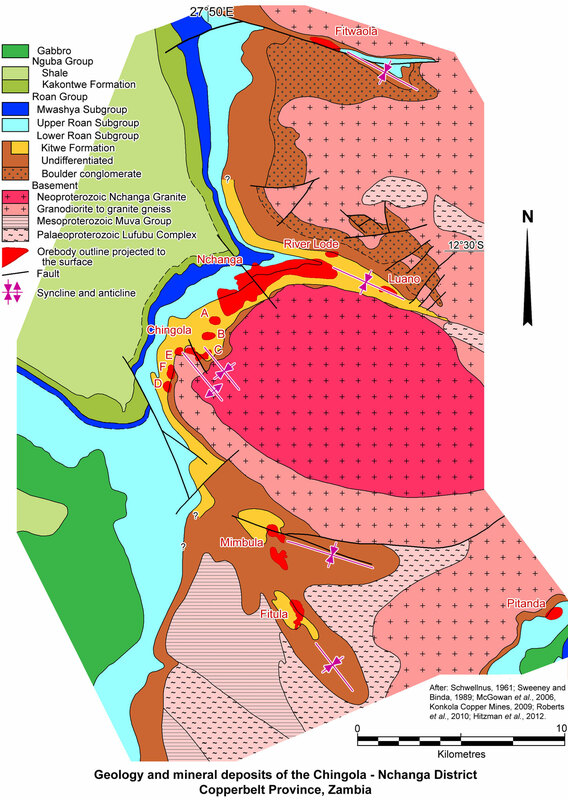 The most significant fault mapped in the mine area cuts the Nchanga orebodies near the eastern margin of the Open Pit, striking generally NW-SE, with a sinistral and vertical displacement of 30 to 40m. There are a series of WNW-ESE trending and NW plunging synformal and antiformal structures affecting the Nchanga area also, including, from SW to NE, the Mimbula, Chingola, Nchanga and Fitwaola synclines and the intervening Chingola and Nchanga anticlines. Most of these structures are strongly asymmetric, with some limbs being overturned. The asymmetry of these structures is not consistent, nor is the attitude of fold planes. The main detachment, or décollement, within the sequence in the Nchanga Open Pit orebody, cuts the upper sections of the Lower Banded Shale near its contact with the Lower Banded Sandstone, separating the evenly dipping Lower Banded Shale on the south limb of the Nchanga Syncline, from the well folded sequence above. Coward and Daly (1984) interpret the structure in terms of northeast-verging thrusting related to a major basement detachment structure, the result of ramped, deep decoupling zones. In places the basement thrusts have been deflected into the overlying Katangan to form décollements as seen in the Nchanga Open Pit, and by injecting basement slivers into the Katangan, as in the core of the Chingola Anticline. This structural regime is consistent with the thrust and nappe tectonics observed in the Central African Copper Belt in the DRC to the northeast, where major detachments are characteristic. At the Chingola C deposit a wedge of basement granite gneiss is thrust over the Nchanga Red Granite and Lower Roan hosts, associated with a northeast-vergent recumbent anticline. At the Chingola B deposits, ~2 km to the NE, an imbricate fan thrust system developed above the basement fault, interpreted to be an extensional fault developed along the granite boundary, reactivated during subsequent compression. This NE-verging fold-thrust duplex has been devekloped ahead of, and as a direct result of, the recumvbent anticline at Chingola C. At Chingola E, Daly et al. (1984) describe interleaved basement wedges of granite and Lower Roan sedimentary rocks. i). The Footwall Orebody at Fitula, Mimbula and Chingola 'D', 'F' and 'E', located below the Lower Banded Shale in the Arkose and Transitional Sandstone units of the Footwall Formation. The ore body occurs within the centre of local basins between basement highs, and may lap onto the unconformity flanking and over the basement high. From Mimbula to Nchanga West, a distance of 17 km, the ore is consistently close to the basement unconformity, and steps gradually upwards across the strata from 105 m below the pyritic Lower Banded Shale at Mimbula, to within 3 m of the top of that unit at Nchanga, where it grades into the Lower Orebody, but is always close to the unconformity. Mineralisation is locally in contact with the basement, and extends for up to 6 m below the unconformity, partly in fractures cutting the Nchanga Red Granite and as disseminations within the palaeoweathered unconformity (McGowan, 2003; McGowan et al., 2006). ii). The Lower Orebody the equivalent of the "Ore Shale/Ore Formation" that extends over much of the Zambian Copper Belt, from Musoshi in the north to Luanshya in the south. The economic Lower Orebody is almost continuous over a distance of ~5 km across the Nchanga-Chingola area, and varies in thickness from 0.5 to 30 m, typically with grades of 2 to 3 wt.% Cu over 6 to 10 m located at the contact zone between the the Transitional Sandstone/Arkose and overlying Lower Banded Shale. It constitutes ~25% of the total ore, and the high-grade Cu predominantly occurs (60 to 90%) of within the footwall Arkose and Transitional Sandstone, but is also found within the lower sections of the Lower Banded Shale, although locally extending to the top of this unit. At Nchanga, the Lower Ore Body is 20 to 30 m thick (McGowan et al., 2006). The distribution of mineralisation indicates that the high grade Cu is strongly spatially associated with the tectonised contact between the arkose and the "Lower Banded Shale" within the Nchanga Pit. 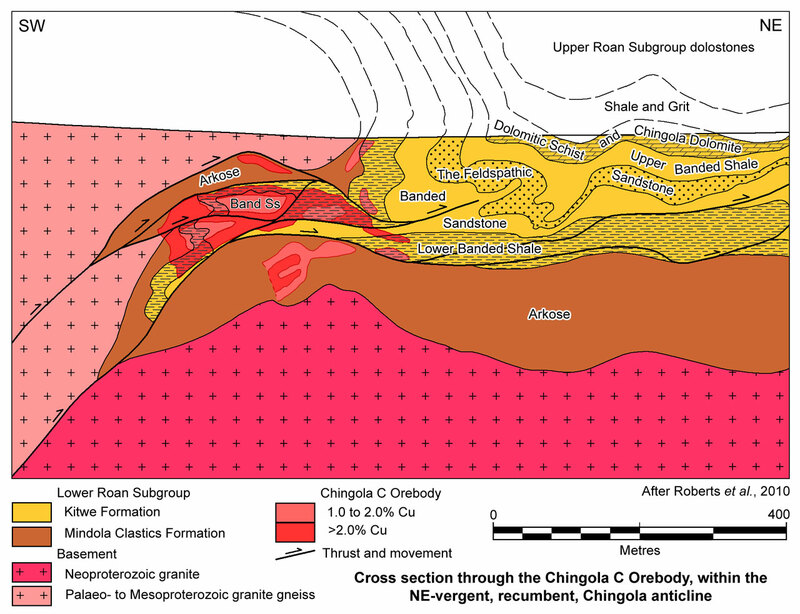 Similarly, at Chingola C, high grade Cu is concentrated in the most highly tectonised sections of the recumbent anticlinal structure, in places, more closely following structures rather than lithologies. At Chingola B, the high grade Cu follows the layer parallel structural detachment that were developed within the Lower Roan Subgroup sequence, particularly at the top of the Arkose unit, but also within the Banded Sandstone. At Chingola B and C, the high grade ore is associated with transgressive structures (McGowan et al., 2006). Cu grades also increase where pre-Katangan extensional structures in the basement intersect the top of the footwall Arkose unit in the Nchanga Open Pit (south limb of the Nchanga Syncline) and the River Lode Pit (north limb), suggesting that basement structures directly control the location of high-grade mineralisation (McGowan et al., 2006). In the upper sections of this orebody, the main Cu minerals are secondary chalcocite and malachite, with the higher grades occurring within breccia, vein and fractures within deformed arkose, between 0 and 20 m below the arkose-shale contact, particularly in the transition (Fleischer et al., 1976). The mineralisation predominantly occurs as chalcopyrite and bornite in the central portions of the orebody, grading outwards into pyrite on all sides via a chalcopyrite zone. Within the central part of the same orebody there is a zonation from the base in the Arkose from bornite and chalcopyrite, to chalcopyrite, to pyrite, to barren Lower Banded Shale. Within the Lower Banded Shale, pyrite is disseminated and orientated along bedding or cleavage, and is also found within quartz veins that are either parallel, or transverse to, bedding. The finer grained disseminated pyrite (10 to 1000 µm) is generally anhedral, whereas within quartz veins, it is coarser (up to 5 mm) and anhedral to subhedral. Locally, pyrite is seen to replace diagenetic nodular anhydrite within the Lower Banded Shale. There is usually an inverse relationship between the abundance of pyrite and Cu sulphides when they occur together, with Cu sulphides replacing pyrite. Where orientated parallel to bedding and within bedding-parallel veins, pyrite is cross-cut and replaced by undeformed chalcopyrite and minor bornite, orientated along a fabric that is steeper than bedding. At the top of the footwall Arkose, euhedral, 0.1 to 10 mm grains of pyrite exhibit evidence of brittle deformation and replacement by Cu sulphides along fractures (McGowan et al., 2006). Within the pyritic interval, there is often a horizon of quartz-pyrite geodes (McKinnon and Smit in Mendelsohn 1961). The sulphides are present as disseminations, concentrations along laminations, and coarser aggregates in bedding veinlets, with grades of ~4% Cu. The sulphides tending to be concentrated within arenites or coarser-grained layers within shale units. iii). The Intermediate Orebody is hosted by the Shale Marker and Pink Quartzite. 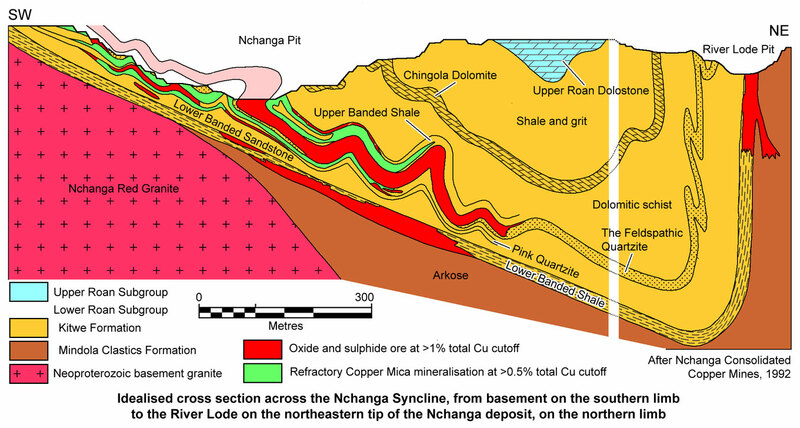 Copper mineralisation is widespread in both members in the Nchanga-Chingola area, although it only reaches ore grade in the Nchanga Open Pit and in a few isolated patches on the northern limb of the Nchanga Syncline. The ore is very discontinuous, tending to occur in separated antiformal crests of the Pink Quartzite. The Intermediate Ore Body may be highly contorted, situated as it is close above the décollement. The ore has been subjected to supergene oxidation and the ore minerals are dominantly malachite and chalcocite with subordinate chrysocolla and rare phosphates. Cobalt is present in part also. The orebody averages 6 m in thickness. Hematite and limonite contents are higher than the other orebodies. iv). The Upper (or Hangingwall) Orebody, which occurs in The Feldspathic Quartzite and the basal section of the Upper Banded Shale, accounting for 30% of the ore at Nchanga. It is developed over a total strike length of 7 km, with an average thickness of 30 to 35 m in the Nchanga Open Pit, and is known for a distance down dip of at least 1 km. The principal occurrence is within the Nchanga Open Pit, with a small structurally complex development (1.2 Mt) that is Chingola 'B'. The base of The Feldspathic Sandstone is generally only poorly mineralised and in places is below ore grade. In the Nchanga Underground mine, the highest grades are in the upper 3 m of The Feldspathic Quartzite, and the lowest 3 m of the overlying Upper Banded Shale. Approximately 90% of the ore is within The Feldspathic Quartzite, while 10% is hosted by the overlying Upper Banded Shale. Mineralisation occurs as fine to dense disseminations to clots of bornite-chalcocite, and generally averages ~2.7% Cu with Co grades (Nchanga Open Pit only) reaching as high as 1%. The orebody is crenulated into anticlines and synclines, many tightly folded to overturned, plunging obliquely into the gently dipping south limb of the Nchanga Syncline, but does not reoccur on the northern limb (Fleischer et al., 1976). Ore zones are preferentially developed in proximity to fault-propagation fold structures, developed internally within the Lower Roan. Where there is no evidence of thrust-fold development within the Katangan sequence, Upper Orebody mineralisation is absent (McGowan et al., 2006). The image to the right is of mineralised arenites of 'The Feldspathic Quartzite' (TFQ). 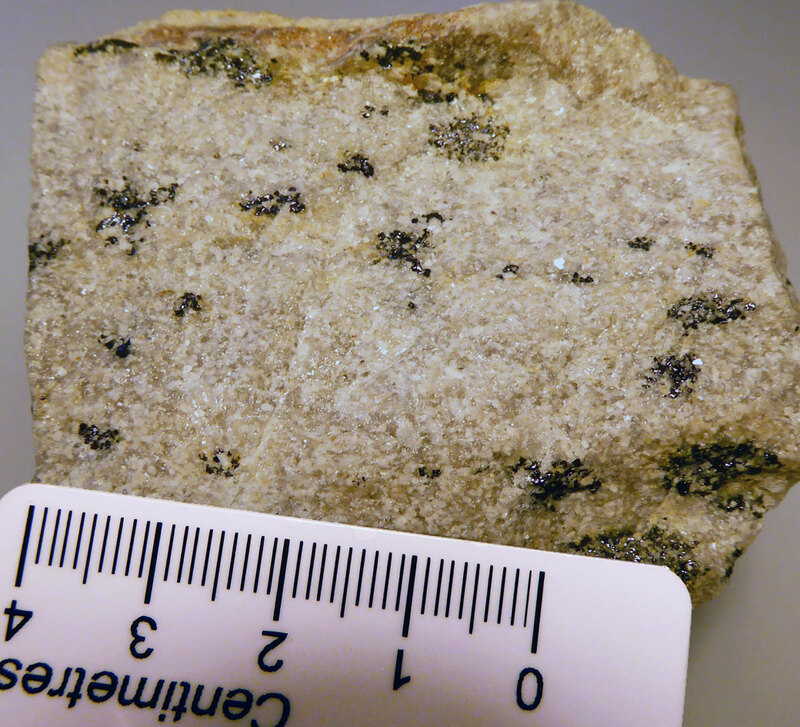 Note the aggregates of bornite (dark specks) distributed generally parallel to coarse bedding. Sample collected in 1992 by Mike Porter. Photograph by Mike Porter. Hanging wall ore minerals include pyrite, chalcopyrite, bornite, carrollite, chalcocite and minor malachite, but are predominantly bornite and chalcocite, which occur as 0.05 to 2 mm disseminations and blebs defining bedding planes, as crowded bedding controlled disseminations over widths of a few cm's or more and as irregular clots of densely disseminated sulphides from 1 to 10 or 20 mm across. These clots are irregular in shape with jagged margins. They are generally elongated parallel to bedding, but not necessarily so. In places there are cross cutting veins of massive chalcopyrite up to several cm's across. Coarse (>2 mm) anhedral to subhedral grains of pyrite are replaced by chalcopyrite, bornite and carrollite, which totally enclose, embay, or replace the pyrite, mainly along fractures. Pyrite is much coarser that the host silicates, and more abundant towards the base of The Feldspathic Quartzite. Bornite is the commonest Cu sulphide, occurring as disseminated irregular grains (0.01 to 5 mm) with chalcocite rims, or within small fractures and bed-parallel quartz–dolomite veins. Anhedral grains of chalcopyrite (0.01 to 5 mm), commonly accompanying carrollite-rich zones, are sometimes replaced by chalcocite and also occur within quartz–dolomite veins. Bornite can be locally seen to extensively replace, or is exsolved from, chalcopyrite. Chalcocite mainly replaces chalcopyrite and bornite at grain boundaries and along fractures, and coincides with an increase in earthy hematite abundance. Carrollite is the principal cobalt-bearing mineral, restricted to The Feldspathic Quartzite, being particularly common within fault-propagation fold zones. It forms coarse (up to 5 mm, average 0.5 to 1 mm) subhedral grains or aggregates of grains, which normally replace pyrite but not bornite and chalcopyrite. Rare malachite replaces all copper sulphides, coats fracture/joint surfaces and occurs within some minor quartz-carbonate veins (McGowan et al., 2006). v). The refractory Copper Mica Bodies which comprise 14% of the mineralisation and are present at a number of the Chingola deposits, at Fitula and Mimbula, and in the Nchanga Open Pit and Underground mines. They generally occur as an upper and/or lower selvage to orebodies, particularly the Upper Ore Body, where the hosts are the Banded Sandstones and the dolomitic schists of the Upper Banded Shale. Cupriferous mica mineralisation is only found adjacent to sulphide mineralisation, and never laterally separated from the sulphide ores. In the Banded Sandstones and dolomitic schists the micaceous nature of the hosts is maintained for a depth of up to 250 m, below which dolomite becomes more prevalent. At Mimbula-Fitula cupriferous micas persist to a depth of up to 150 m, with the bulk being in the zone from near surface to a depth of 60 m.
The Cupriferous micas are brown to dark brown in colour and are visually indistinguishable from unmineralised mica, and is refractory. 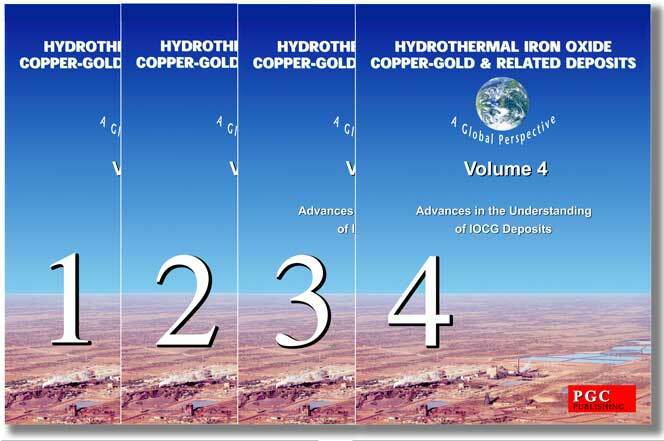 Copper is held in the mica lattices in the exchange position, tied largely to hydroxyl groups in interstratified phlogopite-cupriferous chlorite micas. Some copper is also absorbed on the surfaces of layered mineral structures. The only sulphides present in the main primary ore zones are the Cu sulphides. As the Cu content decreases on the margin of the orebody, chalcopyrite becomes the dominant sulphide and cobalt appears, mainly as carrollite, but also sometimes linnaeite. The cobalt rich margins of the orebody are concentrated in quartzites between shaly bands in anticlinal crests in the Upper Ore Body, with cupriferous zones in the synclinal troughs between. The Co rich shoots are also more dolomitic and have a Cu:Co ratio of 3:1. Supergene processes have been far more important at Nchanga than in the other Copper Belt orebodies and complicate the interpretation of the primary sulphide zonation. Sulphides have commonly been oxidised to depths of over 300 m. Much of the ore over this interval is secondary with malachite being ubiquitous in streaks in the shaly beds and in patches in the feldspathic quartzites, where much of it is associated with Fe pigments. Malachite is also found in massive chunks in the Transition Arkose with chalcocite and cuprite, and after chalcocite, is the most important ore mineral. Cuprite is another important oxide mineral, occurring as earthy masses in the Transition Arkose and as borders to chalcocite layers in the Lower Banded Shale. Native Cu is found in the Lower Banded Shale and Arkose, usually in association with cuprite. It occurs along bedding planes as sheets that may weigh up to 100 kg and as arborescent wire-like forms. Azurite occurs in the upper levels, generally accompanying malachite. Chrysocolla is important in The Feldspathic Quartzite, but is only a minor fraction of the ore. In addition, secondary Cu phosphates, torbenite and libethenite are sometimes found in cavities. Near the surface, the Lower Banded Shale is leached to a light grey to white clayey rock, associated with the removal of all copper and iron sulphides, and oxidation of carbon. Much of the shale, arkose and TFQ are iron stained, with streaks of malachite, azurite and chrysocolla, commonly accompanied by blebs and graisn of chalcocite (Garlick and Haldane in Fleischer et al., 1976). The Luano deposit is located on the north limb of the Nchanga Syncline, ~2500 m east of the River Lode and the main Nchanga deposit. The stratigraphy is essentially the same as at Nchanga-Chingola, overlying a basement of pinkish-white, medium to coarse-graine, crystalline granite gneiss, locally interleaved with mica schist. The host sequence is essentially comprises a lower Arkose unit with a very variable thickness, controlled by basement topography, with lesser conglomerates. These are overlain by the Lower Banded Shale, which varies from 0 to 25 m thick, and is a blue-grey to black, well banded shale, locally interbedded withyellow-brown to pinkish-white shales and occassional grey fine grained quartzite. Banded Sandstone overlies this unit, occurring as pink to brown feldspathic and micaceous, fine- to medium-grained sandstone to sandy shale that is 12 to 40 m thick. The Feldspathic Quartzite (TFQ), which occurs next in the succession, is a consistent 15 to 20 m thick marker, occurring as a white to pink to yellowish-brown, medium- to coarse-grained, well sorted feldspathic quartzite. These are overlain by the Upper Shale, which passes gradationally upwards into the Dolomitic Schists, as described above (Garlick and Haldane in Fleischer et al., 1976). At Luano, the northern limb of the Nchanga Syncline is tightly folded and overturned, characterised by a number of synclines that result in a structural repetition of the sequence, with a general NE dip of 50 to 60°. The axial planes of folding are overturned to the SW, parallel to the general strike of bedding, with axes plunging to the west. A persistent anticline within this complex is underlain by a NW-SE trending rideg of basement rocks that has penetrated the thick underlying basal conglomerates that underlie the Arkose (Garlick and Haldane in Fleischer et al., 1976). Ore grade mineralisation occurs as mixed oxides and sulphides in the upper Arkose and the Lower Banded Shale, mainly within a syncline on the northern flank of the pre-Katangan basement ridge. The ore zone has a strike length of ~750 m from 25 to 140 m below the surface, where the mineralisation splits into a number of thin 2 to 3 m thick lenses. The ore within the Lower Banded Shale passes into disseminated pyrite within carbonaceous shale to the west, south and east (Garlick and Haldane in Fleischer et al., 1976). The Mimbula deposit, is located ~10 km SE of the southern of the Chingola ore deposits. The host Lower Roan Subgroup sedimentary rocks overlie a basement which to the SW comprises, light grey, medium-gained, massive, silicified, feldspathic quartzite and sub-greywacke, with a few small quartz pebbles. This sequence belongs to the Mesoproterozoic Muva Group, distinguished from the Katangan arenites by their steeper dips, and more extensive feldspathisation and shearing and higher degreee of schistiosity and incipient gneissosity. Bands of mica schist are evident, as are common veins of quartz and feldspar. Locally these meta-arenites have been feldpathised to pink to grey porphyroblastic gneissic arkose. Granite and granite gneisses are found to the NE (Smit in Mendelsohn, 1961). • Basal Sandstone, 0 to 50 m thick, composed of grey to white, porous, cross-bedded, slightly micaceous, medium- to coarse-grained and gritty, feldspathic sandstone. Interbeds of as much as 2 m thick occur, comprising ill-sorted conglomerate with pebbles of quartz, feldspathic and fine white quartzite, mica schist and silicified siltstone up to 7 cm in diameter, set in a feldspathic sandstone matrix. Intercalations of greenish-grey micaceous siltstone up to a few cm thick are also evident. • Quartzite, ~30 m thick, comprising a medium to fine grained, schistose to massive, dark grey, micaceous and feldpsthic quartzite, with small characteristic pebbles of opalescent quartz. It contains ~38% quartz, 52% micaceous minerals (biotite and chlorite), and variable amounts of calcite or dolomite (averaging 2.5%), with accessory apatite, zircon, chlorite and specularite (totalling ~7.5%). Locally, layers of siltstone, up to 1.5 cm thick occur, 7.5 to 12 m below the top of the unit. • Interbedded Feldspathic Sandstone and Micaceous Siltstone, ~60 m thick, commencing with a medium-grained sandstone, underlying the lowermost siltstone bed. The sandstone beds vary from white to green- to red-grey and are calcareous, biotitic and chloritic, ranging from arenaceous mica schist to quartzite. The siltstone beds are commonly schistose and vary from a few cms to ~1 m thick. Accessory minerals include rutile, specularite and locally chalcocite. • Transition, ~3 to 9 m thick, red-grey, medium-grained, micaceous sandstone, containing fragments of chert and siltstone. • Lower Banded Shale, ~12 to 25 m thick, composed of thinly bedded feldspathic sandstones and siltstones, with a few, better developed feldspathic quartzites, very similar to that described at Nchanga-Chingola. • Upper Formations, comprising Lower Banded Sandstone, Shale Marker, Pink Quartzite, etc., as at Nchanga, with similar thicknesses. The sequence from the Basal Sandstone to the Transition unit belong to the Nchanga Footwall Succession of the Mindolthe Mindola Clastcs Formation, while the Lower Banded Shale represents the base of the Kitwe Formation. The main structure in the deposit area is a broad syncline plunging gently to the NW, with the sequence having been metamorphosed to greenschist facies. Mineralisation has been recognised at 6 stratigraphic levels between the base of the Lower Roan Subgroup and the Lower Banded Shale. The 'B' ore zone, hosted by the Interbedded Feldspathic Sandstone and Micaceous Siltstone unit, is the most persistent, varying from 1.5 to 9 m in thickness. The other 5 zones are locally thick, but lenticular and of limited extent (Smit in Mendelsohn, 1961). The Mimbula ore is dominantly sulphide, with chalcocite predominating, followed by bornite, chalcopyrite and covellite. Malachite is abundant in upper levels (Smit in Mendelsohn, 1961). 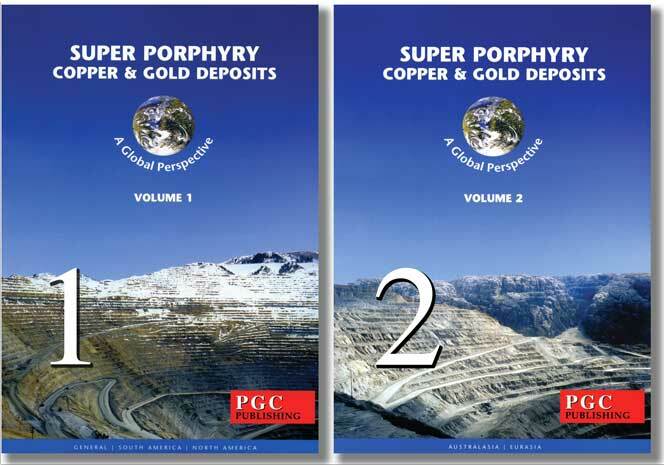 Two main zones of copper mineralisation, a north and south zone are recognised. The southern zone has intervals of ~2% Cu over widths of 35 m at depths of >80 m (Williams et al., 2005). The Fitula deposit, which is ~6 km south of Mimbula, is located within a 6 km long by 1 to 1.2 km wide, asymetric, NW-SE trending synclinal basin that forms the southern extension of the NW-SE trending Mimbula Syncline. The Fitula Syncline has a shallowly dipping (15 to 45°SW) eastern limb, and an overturned, 50 to 70°SW dipping western limb. The eastern limb is complicated by minor synclinal and anticlinal structures, in contrast to the relatively uncomplicated western limb (Cornwall, 1969). • Upper Banded Shale, 9 m of thinly laminated shale. The sequence from the Basal Conglomerate to the Transition unit belong to the Mindola Clastcs Formation, while the Lower Banded Shale represents the base of the Kitwe Formation. The Fitula orebody occurs within a massive, medium-grained, sericitic, feldspathic sandstone at the top of the Fitula Ore Formation. It occurs in the central portion of the gently dipping (0 to 35°) west-dipping, east limb Fitula Syncline, confined to that portion of the NW-SE trending structure, where it locally trends NNW due to a NW to WNW-trending cross fold. The orebody is 1200 m long, up to 6 m thick, and persists to a maximum depth below surface of 120 m. The deposit is a tabular body, gently folded by a series of low amplitude, NW to WNW cross folds. It is overlain by thinly interbanded micaceous sandstones and argillites (Cornwall, 1969). The sulphide mineralisation is disseminated, replacing the fine grained quartzose matrix on grain boundaries and in fractures. The primary ore minerals are mainly chalcopyrite and bornite, with lesser chalcocite, minor digenite and carrolite. Secondary minerals include predominantly chalcocite, with lesser to trace digenite, covellite, malachite and chrysocolla. In the zone of oxidation, which locally extends to a maximum depth of 75 m, the principal copper minerals are malachite, with lesser to trace cuprite ad chrysocolla. Leaching of copper extends from the surface to a minimum depth of ~20 m, in the south, to a maximum depth of 60 m in the north, where the sulphide content of the ore is the greatest (Cornwall, 1969). - production 1950 to 2002 inclusive - 54.1 Mt @ 3.3% Cu (Hitzman et al., 2005 after Williams, 2004). Nchanga, which comprises both a large open pit and a series of underground mines, is operated by Konkola Copper Mines plc (KCM), a subsidiary of Vedanta Resources Plc (in 2014).